Your knee joint is made up of the end of your thigh bone (the femur), the top of your tibia (one of the bones of your lower leg) and your kneecap, or patella. 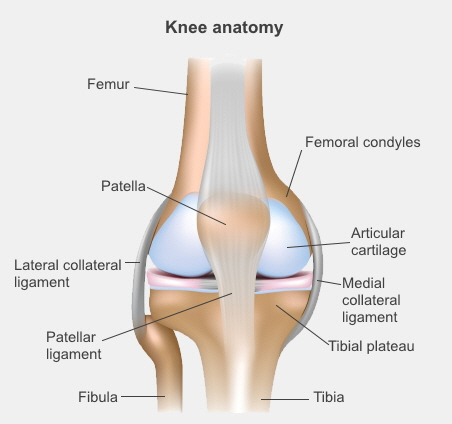 Tough bands of tissue called ligaments hold these bones together, on the inside and outside of your knee. This page explains what happens when the end of your femur or the top of your tibia breaks (fractures). Another page explains what happens when your kneecap breaks. Sometimes when you break the bones of your knee your ligaments are also damaged. The smooth round ends of your thigh bone are called the femoral condyles. If you break one of these, it is called a condylar fracture. This tends to happen with high-speed, high-impact activities, like downhill skiing or parachuting. The flat surface at the top of your tibia is called the tibial plateau. This can break if there is a force down through your straight leg, pushing your femoral condyles into the surface of your tibia – for example if you fall from a height. It can also break if you are hit with great force on the side of the knee, for example, by the bumper of a car. These fractures usually involve the surface of the joint (also called the articular cartilage), which needs to be repaired very carefully. Sometimes, as a result, people go on to develop arthritis, and may eventually need surgery to preserve the joint or replace it. How is a broken knee treated? If the broken bones are in a good position, the bone is stable, and the break doesn't involve the joint surface you will have a brace or cast to support your knee and stop the bones from moving while they heal. You will need crutches to move around. Depending on how your bones are broken, your doctor may recommend you put no weight, or very little weight, on the injured leg. It's very important to follow this advice so your bones heal properly. You will have regular follow-up appointments with the orthopaedic team and will have X-rays to see how well the bones are healing. If your break is not in a good position, is unstable, or involves the joint surface, you will need an operation to move the bones into the right position and hold them there. If the ends of your thigh bone (femoral condyles) are broken, you may have a metal rod through the middle of your bone, or you may have a plate or screws. If your tibial plateau is broken, you may have a plate and screws around the bone. If the surface of your tibial plateau has been squashed (compressed), you may need a bone graft to fill the hole. If you need a graft, the bone is likely to be taken from your tibia or, occasionally, your hip. Your orthopaedic surgeon will talk to you before surgery about what your options are and what they plan to do. You will be given antibiotics during your surgery. You may have a drain in after your surgery and are likely to need a brace to support your bones for a few weeks while they heal. Please ask a nurse or doctor if you would like more information about your operation and recovery. If you are older than 65, Older Person's Health Specialist Services will also see you and review your health alongside the orthopaedic team. Written by HealthInfo clinical advisers. Endorsed by orthopaedic surgeon, Canterbury DHB. Page created January 2017. Last updated November 2018.